In recent months, the ASPCA Animal Hospital (AAH) has seen an increase in cases of pets with matted coats—many of which have necessitated surgical procedures, and in severe cases, amputations. 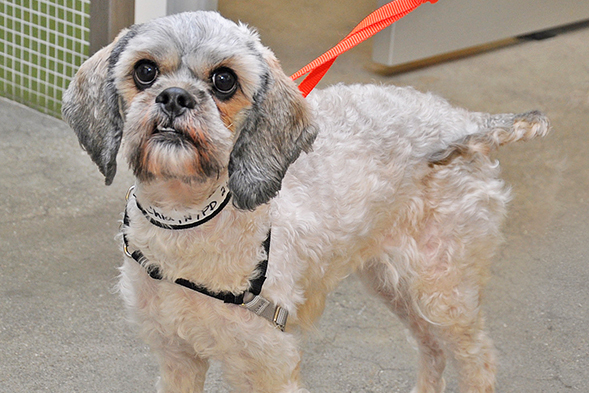 One such case involved Chia, a one-year-old female Shih Tzu who was surrendered to the ASPCA last November. When ASPCA staff opened Chia’s carrier for the first time, they found that she was encased in a severely matted coat. They were unable to even locate Chia’s ears or neck in order to place a lead around her. In order to help Chia, a licensed veterinary technician at AAH began to shave off her coat. Her matting was so severe—and coated with feces, urine, and foreign debris—that the vet tech was able to remove the majority of the matting in one large, intact piece, which weighed more than one pound. Beneath the matted coat was a gentle, loving 12-lb. dog. After receiving treatment for some skin issues and undergoing a spay procedure, Chia was adopted and is now a cherished family member. Even very mild hair mats can cause skin irritation and progress to infected lesions. A wound left unattended can accumulate maggots. Fleas and ticks can live deep in the hair mat—out of the owner’s sight—and infest the animal. Mats around the hind end can cause an accumulation of feces and in severe cases impede defecation. More severe hair mats can cause strangulating wounds, most often seen on an animal’s limb. The mat can grow around the leg in a circumferential fashion causing blood supply to be cut off. In severe but reversible cases, the mat cuts into and sometimes through the skin which can be surgically and medically treated over a long period of time typically weeks to months. In severe but irreversible cases, the mat can cut down to the bone and /or become so tight that blood supply is cut off on that limb requiring amputation. In general, mats are extremely uncomfortable for your pet and should be avoided. Owners should be aware of grooming needs based on hair type and breed of the animal. Pets with medium-to-long hair require frequent brushing, some even once daily. Speak with your groomer or veterinarian regarding appropriate brush types for your pet’s hair. Early mild mats can be brushed out. Mats which have progressed require clipping the hair. If you notice a mat which cannot be easily brushed out, your pet should visit a groomer or veterinarian. They can safely clip the mats out and provide instant relief. If a pet is severely matted he may require sedation and full body clipping. NEVER cut mats out with scissors. Your pet can unexpectedly move or jerk resulting in a severe laceration or puncture. Visit our Pet Care section for additional tips for grooming your dog or for grooming your cat.